Every late August bank holiday, the Carnival brings colour, music and joy for all communities in Leeds and the North of England – and it has been doing this since a few West Indian students brought it here in 1967. My map needed to tell Leeds Carnival’s hidden stories and work as an artefact that contains a lot of information in one piece. I started my research and discovered Carnival’s roots in West Indian colonialism and slavery, its political and social contexts, the influence of African cultures in the symbolism and design of characters, costumes and stories as well as connections to eighteenth century French court fashion. Then I got to work on investigating the story of Leeds Carnival pioneers and the growth of this dazzling event into a world-renowned and hugely well-attended summer festival. I was lucky to have some key members of the Carnival community advising me and providing materials that spanned the last 50 years. I worked with curators, designers and other creative partners to bring the map to fruition and distribute it through various channels. I knew as soon as I had started my research that the piece should reflect the colour and playfulness of Leeds Carnival as well as have a handmade feel to it. Since my personal art practice involves working with layered and collaged painted textures and elements, I knew this would be the best way to proceed. The only question was how to handle all the written information that needed to be included. Hand-painting would take too long and might have to be corrected later. The most viable solution took me in a new direction: I decided to use my iPad Pro to create the lettering using Adobe Draw, an app that produces vector images that can be resized without any loss of resolution. Once I had an approved full-size pencil sketch with all elements in place, I painted the golden background in acrylic paint on heavy white A1 paper using a wide brush for good coverage and textures. I made a selection of coloured painted textures in acrylics and gouache that I scanned and saved. I hand painted the map routes in the centre. Then came the time consuming but fun part: filling in and arranging all the background text boxes, feather shapes and title letters with scanned painted textures. Once these were all in position, I fired up the iPad Pro. I made some of the larger text by drawing the letters in Adobe Draw, exporting and resizing them into the map. For the smaller text, I used an app called Astropad, which allowed me to connect my iPad to my desktop computer and mirror its screen on my tablet. This meant that I could draw and write straight into the map, make corrections and tweaks with ease. And I should mention that my iPad Pro is the 9.7 inch size! Not everyone will find it easy to work on that smaller size but I love it for its portability and had no problem doing what I needed to. I really enjoy the ability to mix traditional and digital processes in my work. 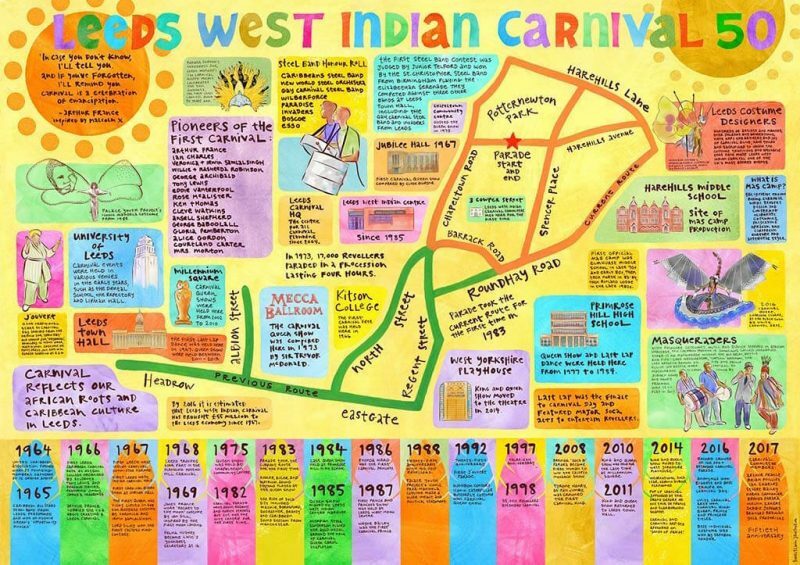 The Leeds West Indian Carnival Map 50 had its debut in the 50 Years of West Indian Carnival exhibition at The Tetley in Leeds where it can be seen until October 29, 2017. I am truly proud to have made a small contribution to telling the rich story of Leeds Indian Carnival. Many thanks to everyone involved!